I am so excited to share a new quilting conference that I am a part of next month! It’s called teh MOD BEE quilting conference and it’s going to be exclusively online! Quilting conferences or retreats can be pricey and hard to get to so the fabulous girls from Simple Simon have come up with a fun new way to participate in one! Today we are excited to announce that tickets sales for Mod Bee are now open! Mod Bee is 3 day, online conference full of interactive quilting classes taught by some of the internet’s favorite quilters. I will be teaching my Sweet Squares quilt! 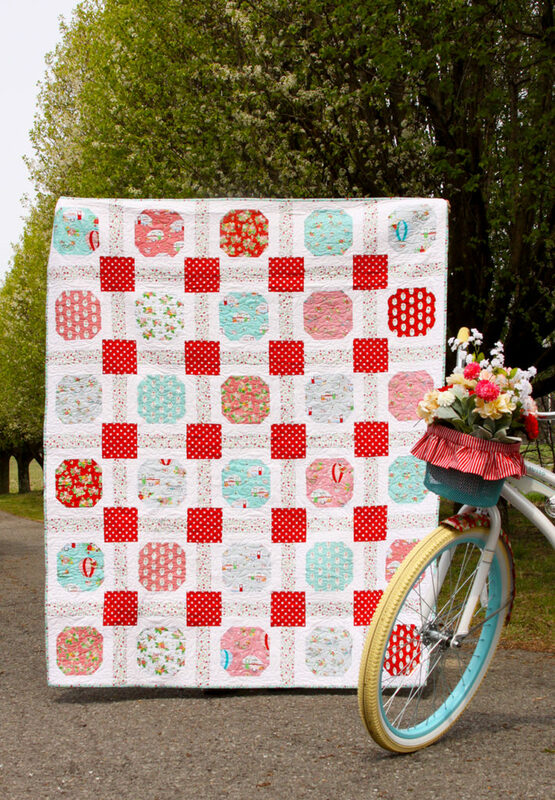 It’s a fun quilt that is great for showing off large size prints. It’s perfect for beginners or expert quilters too! As part of your registration fee you’ll receive this pattern for free, along with 11 other PDF patterns from the other teachers! I have a discount code for you to use as well! If you enter the code FLAMINGOTOES at registration, your cost for the conference will go down to $55!! Register HERE for the MOD BEE Quilting Conference! I’d love for you to join us that weekend! It’s going to be such a fun weekend of learning and sewing! I’m also having a giveaway!! I’m giving away one ticket to MOD BEE! Enter the giveaway by leaving a comment below – have you ever attended a quilting conference? If not, what would you like to learn at one? I’ll draw the winner this weekend! And if you go ahead and purchase your ticket, then win, we’ll refund your ticket price! I have never been a part of such conference. I am good at the traditional Indian method of quilting, but the Western world still amazes me with their Quilting. What is Indian Quilting? Indian as in Native American or India? I have never been to a quilt conference, but I would love to learn simple techniques that improve my quilting. This sounds really good! I have gone to a few retreats and really enjoy the instruction, patterns and tips offered. This sounds wonderful! I’m 52 and I have Parkinson’s Disease. I’m teaching myself to sew as a way to keep my brain in use, lol. Also to try and control my tremors, oh well it was a good dream! Seriously I would love love to do this, I am not allowed to drive anymore so I look for ways to busy myself and as I said I am teaching myself to sew. Classes like this would be perfect for me. Thanks for taking the time to consider me. Have a great conference! I was actually at my first quilting retreat last weekend and came down with the flu the first night and had to go home☹️ But it was fun to see what everyone was working on and different techniques I know nothing about! I’ve done online classes with FB groups. LOVE LOVE LOVE them. It’s nice to be able to go back and rewatch the videos and also see other people’s progress along the way as well as ask questions. ALSO, you work at your own pace. I have never attended a conference where classes are taught but I have attended retreats where you just gather and sew for 3 days. I’m new at this so I would like to learn how to best prepare a finished project to send out to be quilted and maybe see some demos of longarm quilting. I have been looking at this since it was announced. Checked the days with the family calendar and it looks possible for me! I have been seriously quilting less than a year, but sewing and crafting all my life. This looks like a great opportunity to learn! oh man! So sorry I have to miss this! It is our winter break here in Ontario Canada and for the first time ever we have decided to go on vacation with the kids for the week!Hope you do this again! Well, I just signed up for your fabulous site. I adore all of your colors and that USA quilt. I have not been to a conference for quilting but one for stamping. I learned quite a lot. I love the way you explain things so naturally. I have been to other conferences, but not a quilting one. I do enjoy learning tips and tricks and new techniques from other people. I like the idea that you will have access for a year, I don’t work that fast! The conference sounds like such fun. I follow several of the teachers and will check out the others. I’ve never been to a quilting conference but this sounds like fun. I’m open to learn anything new. I love your quilt. I want to join the conference and am excited to learn some new things. However, when I went to the registration page, there was no place to add the discount code. That was quite disappointing. The page took me right to my Paypal. I have never been to a conference but would love to join this one. I like to learn new techniques and different tricks to quilting. I have not been to a quilting conference but did my first quilt retreat last year. I love this idea of online learning! With kids’ schedules that’s more doable! I just love learning time-saving and make-it-easier quilting tips as you teach. I have very similar taste in colors, happy, fun quilt designs as you so look forward to your teaching! I have never been on a quilting retreat. I think I just need more practice at basics. The online format seems more do-able…no packing up everything just to realize you left something important at home! I have not been to a quilting conference, but when I go to one, I would like to learn different techniques to help me find my own way through the quilting world! I’ve never been to a conference, but I would love to learn tips to be more accurate! I am going to my first quilting conference this month – QuiltCon in Nashville! And I have signed up for your MOD BEE – very excited for both!! I have never attended a sewing conference, either! This is somewhat enticing, I must say! I couldn’t find anywhere to enter your code FLAMINGOTOES for the discount when I registered. Is there a way to get a refund for the discount amount? Thank you. great time, but having to pack and carry your machine and supplies is very labor intensive . This online option sounds great. Went to the Houston Quilt Festival several years ago, but no quilt retreat/conferences. Would love to win!!! What an amazing idea! Would love it! Sorry, I realize I am already subscribed. So You need only to send once! This is so exciting! I have never been to a quilt conference, but boy oh boy do I want to! This sounds so exciting!